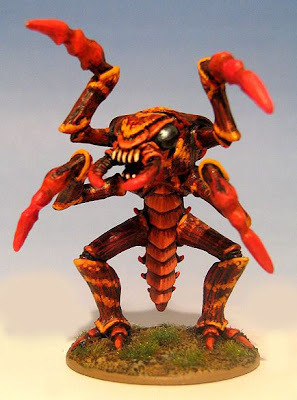 The Nauticans for Warhammer Fantasy Battle: The Lobstrosity profile will probably be "tweaked"
The Lobstrosity profile will probably be "tweaked"
So far I have only really found one model that I think will be suitable as a Lobstrosity (it's the Kithix insect at Hydraminiatures.com - looks nasty heh ! ). I have been in touch with a very friendly chap called Matt at Hydra and he tells me the miniature was designed for a 40mm base. Also, Matt told me that if I want to use the model in a unit then I'll need to adjust the appendages a little so they allow the models to be placed in base to base contact. I don't think adjusting the arm positions will be a big deal but the base size is bigger than I thought and the unit was designed with a 25mm base size in mind. So far I have not found any more suitable miniatures so I'm going to adjust the profile. Obviously the base size increase is a disadvantage for the unit because it will allow more enemies to be in contact during close combat. Also, the Lobstrosities currently have 2 wounds which is unusual (or possibly unique) for a 40mm base model. The new unit cost is likely to be about the same as it was, possibly slightly lower because of the limit to the unit's effectiveness at dishing out the pain in combat. The overall impact will be that the unit becomes less proficient in offence and slightly more proficient in defence. The unit is unbreakble so I did not want it to become any more effective at killing the enemy, it is primarily a blocking unit. I'm happy with this modification given the recent addition of the attacking aligned Wereshark and Octobipod units. I hope to change the army list in the next couple of days (I'm just giving the idea a little time to sink in before I commit).